I do this each year and usually alone. I took Simon the wildlife adviser once.. and at this stage.. perhaps it falls more within his department. I drive up onto the Mendips, turn left at Priddy, follow a narrow twisting lane and park. The views out though the gateway are immense. 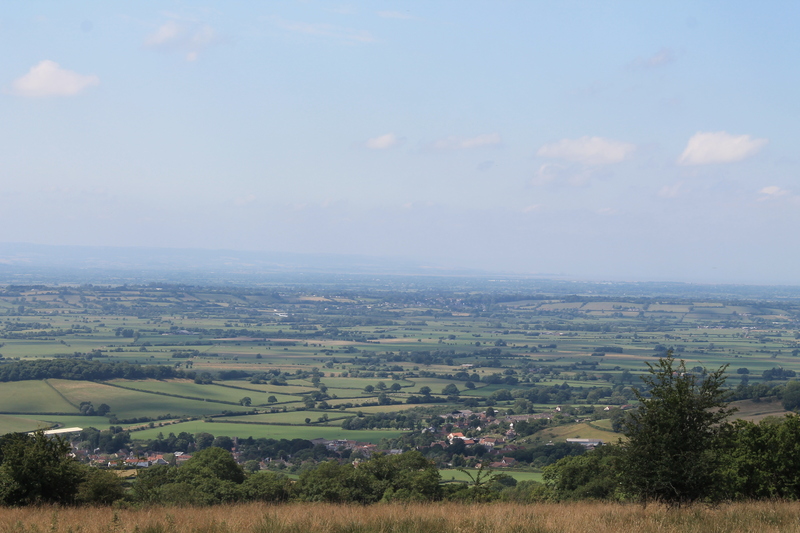 The sweep of the Somerset Levels, with Glastonbury Tor and Burrow Mump projecting from the flat lands. 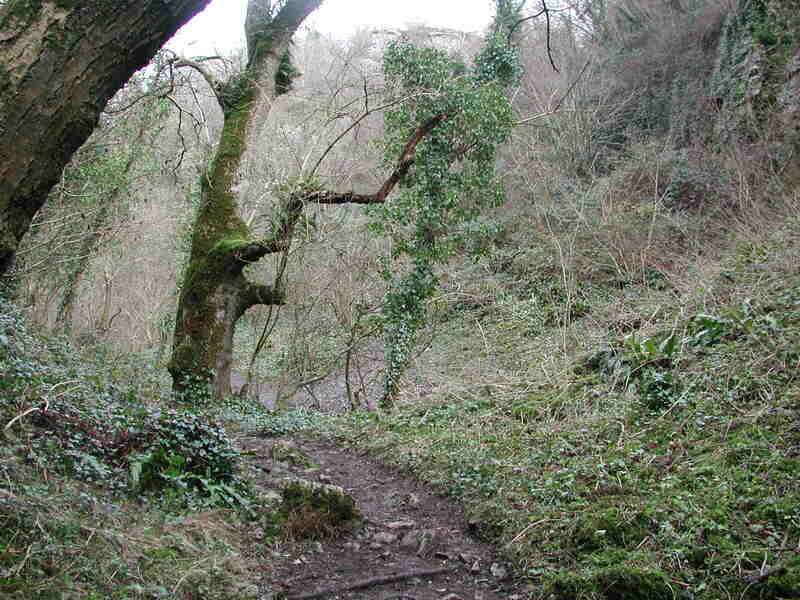 Burrington Coombe and Cheddar have roads running through them but Ebbor Gorge is only accessible by narrow footpaths. From the grassy car park you cross a stone style and plunge into woodland. As you descend the steps, you start to feel that the modern world has been lost. Who knows what ancient creature might emerge from the dense vegetation. It feels like a remote place and the bottom of the gorge is warm, still and humid. Then there is the steep ascent up the other side, pausing for breath from time to time, keeping an eye open for the slight hidden path created for the dig between the trees, along the gorge edge. The woodland path into Ebbor Gorge. There it is. I weave up and down and start to hear faint voices. Turn a corner and the cave is there. Much activity and a welcome from Danielle who has been expecting me. Many of the Ebbor Caves were discovered by Victorian and Edwardian explorers and dug away. There are displays of some of their finds at nearby Wookey Hole. They were big on enthusiasm but their techniques were not great.. so to find an unexcavated cave is exciting and rare. 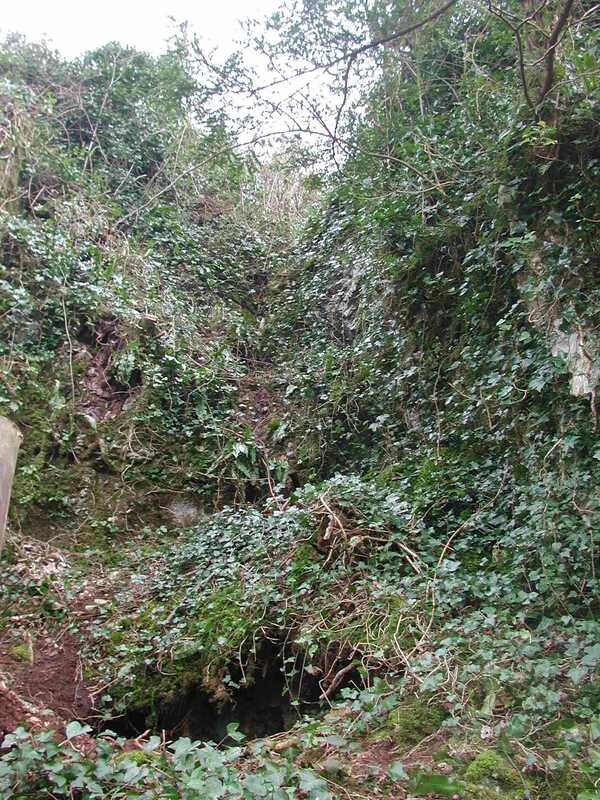 The Gulley Cave in 2005 before excavation. Ebbor is a Natural England reserve leased from the National Trust. 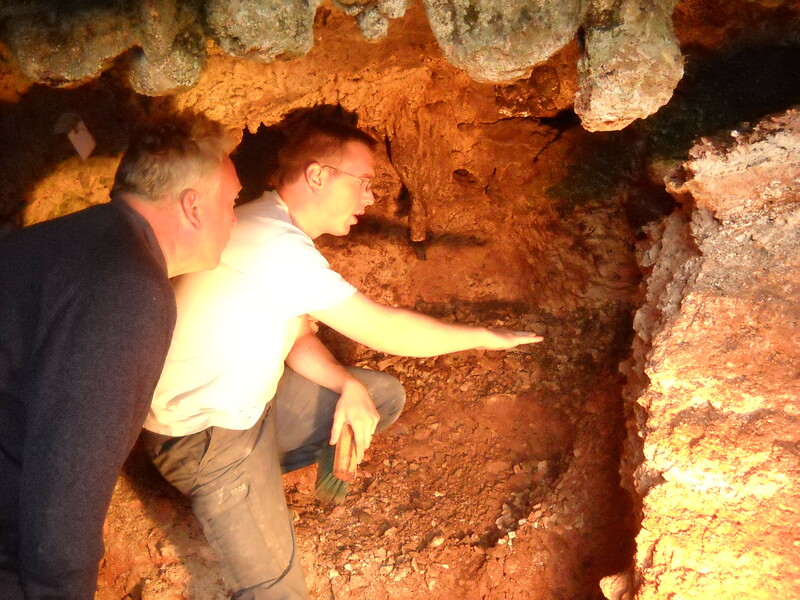 Bob Corns, the NE ranger showed me the potential of Gulley Cave in 2005 and Danielle and her team from Royal Holloway College, London have been investigating the site since 2006. They are top experts in the Palaeolithic and each year descend a little further into the remote past. They tell me that this is an extremely important site. 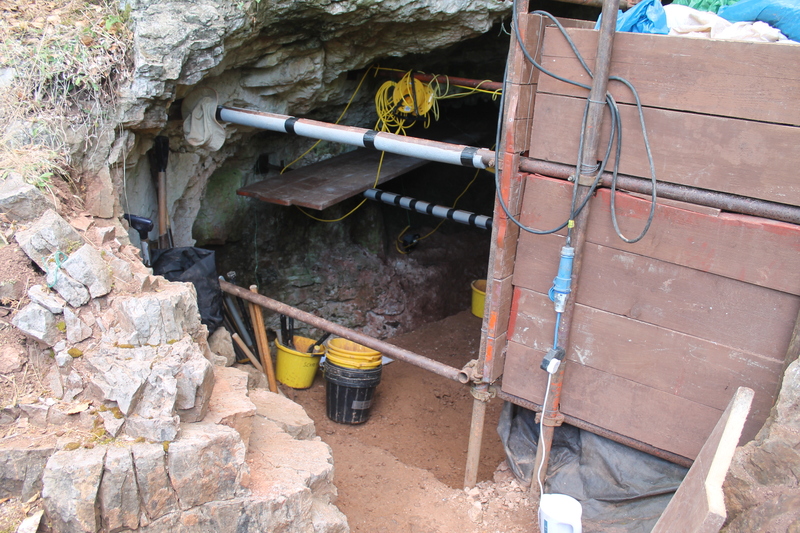 40% of the cave deposits have been preserved for the future and have been kept in place by scaffolding. The finds consist of animal bones, beautifully preserved because of the lime-rich conditions of the soil. Danielle tells me about the extreme cold following the last glaciation. We would have to go to the Russian Steppes to find such conditions today and the animal bones in the cave reflect this. Lemming, arctic fox, wild cat, an extinct type of wild pony, reindeer and hundreds of tiny animal bones. These are the remains of voles and other small rodents probably brought to the cave as pellets from hunting birds like owls. They have provided a range of radiocarbon dates from 10,000-13,500 years ago. The changing types of rodent reflect the fluctuations in temperature during the Holocene. The hope is for evidence of human occupation but no tools have been found. The larger meat bones have been discovered welded to the back of the cave with a hardened lime solution, which seeped from the cave wall over time. The massive bones, representing the haunch of an giant extinct type of cattle (aurochs) were found there. Not something that would be tip-toeing around the gorge and probably too large to be brought there by wolves. Another long bone showed burning and had been fractured to extract marrow. 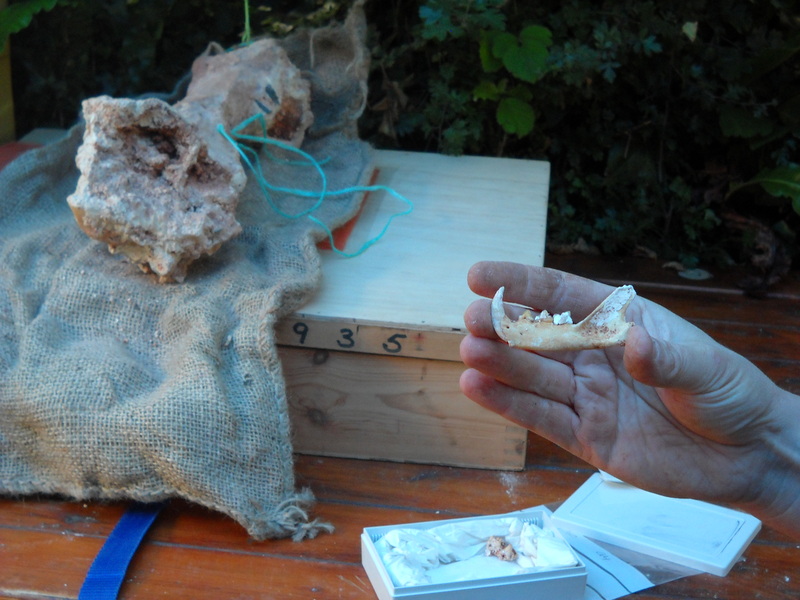 These are the clues at the moment that a family hunted and brought meat joints hear, roasted them on a fire and had meals in Gulley Cave, perhaps cleaning up the bones by placing them at the back of the cave. The south facing view from the cave mouth across the gorge would make it a good secure, sheltered home. The cave has filled up over many thousands of years. Beneath a thin crust of lime which has dripped and accumulated from the cave roof is a breccia deposit of soil and stone deposited during post-glacial cold tundra conditions 11-14,000 years ago,. This year, Danielle told me, the finds have been few. The excavation has entered the last ice age. 15,000-25,000 BC was a very cold time and people probably didn’t live in Britain then. The soil has changed to frost fractured fragments of rock. Below this, about 30,000 year ago, might be found remains of woolley rhino, mammoths and perhaps earlier remains of Neanderthal man. The story continues. I think that I will be visiting this cave each summer in years to come. This is rare evidence for deep time and Gulley Cave is yielding a fabulous stratigraphy. Gulley Cave this year. Below the tundra soils is a deep deposit of frost fractures stone. These accumulated during the last glaciation which was too cold for people to live in Britiain it is thought. Depth of this glacial period of cave filling is unknown but scaffolding has been inserted to hold back the reference section as the cave gets deeper. The next soil layer and warmer period will indicate deposits about 30,000 years old. This entry was posted in Archaeology, Bones, Conservation, Discoveries, Excavation, Finds, Palaeolithic, Somerset, Uncategorized and tagged Archaeology, bone, culture, finds, Ice Age, Palaeolithic, Somerset, Trench by martinpapworth. Bookmark the permalink. Really interesting. The beginning of your blog brings back memories: I love those views across the Levels when I’m driving out that way. As for Cheddar Gorge – I decided to climb up part of it when I was 13 yrs old & promptly got stuck! The contents of the cave is fascinating. I find it strange to think of the creatures that used to roam where we now walk. They are very steep aren’t they. Good place for rock climbing. The Mendip gorges are pretty special. They feel like another place. At least further north than Somerset. The first time I went to Ebbor, a large tawny owl flew out at us from a cave, I felt that there might be a bear or a wolf round the next corner.